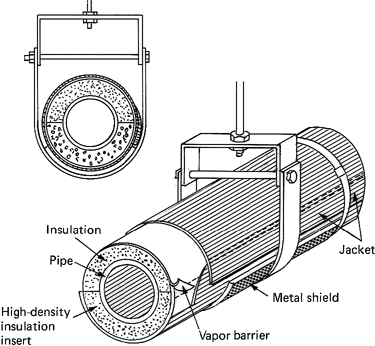 A jacketed pipe is a pipe protected by an insulating cover. Typically used for the transportation of hot steam or hot water, a jacketed pipe maintains the temperature of the material flowing through it. Often found in buildings and ships, jacketed pipes also can be found in very large-scale pipelines that carry oil in severely cold areas, such as the U.S. Alaskan oil pipeline. The jacketed pipe used in such large pipelines prevents the harsh elements outside from turning the oil inside from becoming so thick that it can no longer flow through the pipeline.In large buildings, a jacketed pipe is often used to carry super-heated steam from heating units located in the basement of the building to heating units in the uppermost floors. In order to maintain the heat, the jacketed pipe is manufactured with very heavy fiberglass insulation. The fiberglass insulation is often coated with a foil-like material in order to enhance the heat retention properties of the insulation. Seams and joints in the covered pipe are taped with an insulating tape to create a seamless cover. Not only heated pipes are insulated. Jacketed pipes are also used to insulate very cold pipes. One example is a pipe transporting liquid oxygen, an extremely cold material that is often used aboard ships. In an effort to prevent the pipes carrying the cold liquid from becoming frost and ice covered as they snake through the ship, the heavily insulated cover keeps the cold inside the pipe. If not for the insulation covering the pipe, any contact with skin could result in a cold burn that would require immediate medical attention. Pipes carrying refrigeration materials are also covered with thick insulation by covering the pipes with insulation, the compressors and evaporators are not worked as hard in order to maintain the cold setting of the refrigeration units. The use of a jacketed pipe also aids in the reduction of condensation-based water dripping from the super-cold pipeline. This reduces the risk of slip-and-fal accidents in areas where the pipeline passes through walk ways and passenger corridors. In the largest form, a jacketed pipe is often created by applying spray-on insulating foam to large pipelines. This type of insulation-covered pipeline, used in cold climates, prevents material such as crude oil from becoming cold and thick. Without the insulation, oil flowing through the massive pipeline could become too thick to pump and could virtually stop flowing. This would hinder any attempts at loading the crude onto ships or trucks for transportation to refineries. 1 Comment on "Jacketed Piping"
I believe the apt title for this shall be insulated piping and not jacketed piping. Jacketed piping is referred when we have core and outer jacket pipe for similar purpose, heat retention.